I’ve noticed at least two things about the exercise of writing every day. First, it’s actually pushed me to be more active than I would normally be. I can be a bit of a homebody. I’m more than content to sit somewhere nice and read book, watch old episodes of Top Gear, or just wonder at, say, the physiology and physics required to properly use a bidet. For example, the last time I was in Thailand, I once spent a day in Chiang Mai in bed, reading one of Terry Pratchett’s Discworld books. I had traveled thousands of miles to an exotic city in the north of Thailand to read a fantasy novel I’d picked up at a used bookstore the day before. Rick Steves would be so disappointed. That kind of behavior comes with the territory of being a closet introvert. It also means there is quite a bit of inertia to getting me out of bed in the morning. That’s partially how I end up doing silly things like deep water solo and trying to climb into lagoons. Actually, I wouldn’t have thought to do deep water solo if not for Darrel. And that’s what I mean. I’m totally down for just about anything. I sometimes just need a little motivation. Thanks to my daily chore, I have a little bit more of a push. Second, I’ve learned that writing is work. Don’t get me wrong. I enjoy this. But there are days when nothing happens, sometimes for good reason. Take today, for example. Darrel decided he was going to stay on Tonsai to be closer to climber central. I checked in with the dive shop on Railay first thing in the morning and found out there was a four-day liveaboard diving trip in the Similan Islands starting in two days. To get up to Khao Lak in time, I’d have to leave Railay the next morning. I decided to stay in Railay for my last day and not make the move to Tonsai. Darrel and I exchanged contact info. He packed up his gear and headed out. I plopped myself under the fan in the room and wrote out the previous day’s entry. I had every intention of finishing the entry, sending it for an edit, then going out to Tham Phra Nang Nai, a cave I’d walked by every day I’d stayed at Railay Cabana. I heard it had stalagmites and bats. Bats, to me, are like flying mice. They kind of freak me out. I thought it would be fun. Guess I was more tired than I thought. Perhaps it had something to do with clinging to an ocean cliff the day before and the two days of scuba diving. Regardless, the point is I spent the day drifting in and out of consciousness, writing, drinking water, and eating what leftover snacks I had in my bag. That does not make for a good story. It barely makes for a lame excuse for this entry. I’ve learned, however, there are things I can do if a day doesn’t have a good arc. Bulleted lists, for example, are a great way to get out punchy ideas that aren’t worthy of a full entry or that don’t fit nicely into a narrative. It’s not that these ideas aren’t good. It’s just that they’re hard to fit in. They are also a lot frickin’ easier to write. That’s because they’re short and you’re not required to fit them into a narrative. Peter King has made a living off this kind of thing. It is, however, a form of writer’s cheating. Since I didn’t do anything today, other than buy a ticket out of Railay, I’m going to resort to a list of random thoughts, incomplete ideas, and gross simplifications. Enjoy. •A couple nights ago, Darrel and I had dinner with an Israeli couple who were about our age. The wife was attractive and had a warm smile. The husband had a quiet, more serious manner. He was funny, though. When I couldn’t finish my curry rice, but contemplated ordering mango sticky rice, he leaned over and said, “This is the behavior of a woman.” I told him I wasn’t so sure, but that it was my behavior. I did not, however, end up ordering the mango sticky rice. I think he was taken aback that I was a lawyer, especially after he learned that I was staying at one of the cheapest places on the peninsula (e.g. no sink, no a/c). He and his wife were at a much nicer resort with their daughter and some other family. In fact, he tried to pay for my meal (Darrel had eaten earlier in the evening). He said he wanted to pay so that I would have good thoughts about Israel. I wasn’t so sure that was the reason. Out of pride, I insisted that I pay for myself, saying that if he didn’t accept the 100 baht I was shoving in his hand, I’d only think badly of Israel. He relented, though I think I might have offended him. •Thailand has many kinds of ants. There are ones that resemble the black and the red ants that you see in California. There are larger versions with longer thoraxes. The ones that fascinate me are the little tiny ones, no bigger than the size of a comma. They move insanely fast. I imagine that they break the sound barrier, except we don’t notice because the boom is too small for human ears. It’s mesmerizing to watch them frantically zooming here and there. I try not to think too hard about where such tiny creatures might go when I’m not paying attention. •I’m amazed at what little things can make a big difference when I travel. For example, the only reason I met Darell was because he happened to stick his head into the dive shop to ask where he could find a cheap hostel. I overheard him and offered to help. We ended up being roommates for a couple of days. Because of him, I went deep water solo. Or take my day at the Krabitown bus station. I almost went to Ko Lanta, but opted for Railay at the last minute because I figured it’d be cheaper to start there and move to Ko Lanta later. I never left Railay. I never made it to Ko Lanta. Instead I ran into Lars twice and we ended up rooming together for a few days. Without him I’d have never learned about Dutch tradition of Sinterklaas. •Sinterklaas is the most awesome holiday tradition ever. As Lars told me, it’s a Dutch holiday celebrated on December 5. It’s sort of like Santa Claus, except Sinterklaas arrives on a ship. He’s helped by little black helpers called piet. There are piet of all kinds: grumpy piet, sleepy piet, joker piet. There are apparently thousands of piet, each with its own characteristic. Did I mention that the piet are black? (Note: there appears to be some debate on why they’re black; might be a reference to their Moorish roots or that they were chimney sweeps. Google it.) Older children dress up as piet and help in a town’s celebration. There’s a parade that seemed a bit like Holland’s version of Carnival. The parade features Dutch youths painted black, accompanying Sinterklaas. Here’s my favorite part. Parents tell their children that if they do not improve their character or their grades or whatever, instead of giving the children presents on December 5, Sinterklaas will kidnap them and taken them back to his homeland, Spain, for a year. The idea that 1) Sinterklaas is a child kidnapper and that 2) he bestows his benevolence or punishment from Spain cracks me up. I can imagine all these Dutch children cowering in fear of the Spanish invader from the south who, if they’re bad, will whisk them away to the warmth and sun of the Mediterranean. If I ever have kids, I’m raising them on Sinterklaas. I will tell them Sinterklaas comes from Bakersfield. •I’ve been here nearly three weeks and I’m still getting into the car on the wrong side. Whenever someone drives me some place and I have to sit in the front seat, I end up standing in front of a confused driver as he tries to reach around me to get at the driver side door. •I have not been eating enough mango and sticky rice. Today, to remedy that problem, I ordered one. It came with sesame seeds on top. I learned that I prefer my mango and sticky rice plain. Stupid Travel Tip of the Day: If you’re going to go on holiday and write about it, practice being an extrovert. Not So Stupid Tip: Bring sunscreen and use it often. The sun is different here. I almost burned between dives because I didn’t reapply. This happened even though I was only out of the water for one hour, the whole time in the shade. If you’re going to over pack on something, bring a little extra sunscreen. Not only will you go through it quickly, it seems to be much more expensive here in Thailand. If you do go to Penang, visit the SDA hospital (http://www.pah.com.my/about_us/History/index.asp). My great grandfather opened it in 1924 (or, rather, the clinic that has since morphed into the enormous hospital!). I can ask my parents for their contacts there, if you want hookups. When they were there a few years ago, a very nice girl named Rachel drove them all around showing them the sights. I’m in Penang now. I’m going to have a look at the hospital. I am still writing. Now more than ever since I’m trying to compile diving pics and experiences. 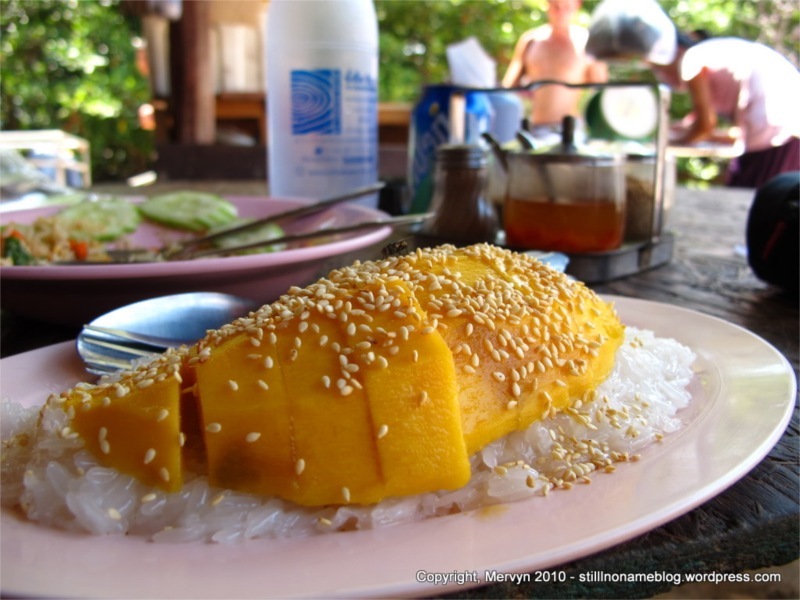 Unless you eat mango sticky rice at least once daily, you are not at all eating enough of it. Even in the states, I eat it at least once a week, but the mangoes don’t look nearly as beautiful as the one in your photo. I concur. But it is harder to find than I’d hoped. Perhaps I’m not looking hard enough? Perhaps I’m getting too many massages. mango sticky rice is to Thailand as gelato is to Italy. I had at least two scoops a day in Italy. Go and do likewise. I’m trying, but it’s harder than it looks. Mango sticky rice hasn’t been as plentiful as I’d hoped. In its place, I’m having nearly daily massages. For me, this is an adequate substitute. Seriously, you’re my friend I constantly live vicariously through! Hmmm… you naming your site along those lines would be quite appropriate! Thanks. I’m really glad you’re enjoying it. It makes writing worth it. I’ll keep writing and taking pics so long as you keep reading. I think I may have a name for the site. It’s not along the “vicarious,” unfortunately. I’m still contemplating it, though. Stay tuned. Is it durian season, yet….? I really do love mango and sticky rice, but see if you can get invited to a durian/sticky rice/coconut cream party…..like nothing you’ve ever experienced. Your photographs are amazing…and the narrative gripping. I’m enjoying both immensely. Appreciate the kind words. I’m in Penang right now and will see if I can find some durian. I’ve already stumbled onto some fine late night cuisine (see upcoming posts) and look forward to hunting durian. i laughed out loud at the thought of sinterklaas coming from bakersfield! good job on the travel blogging =) i have to catch up on all the other posts now! Thanks. Let me know if you think of something that might help the site.